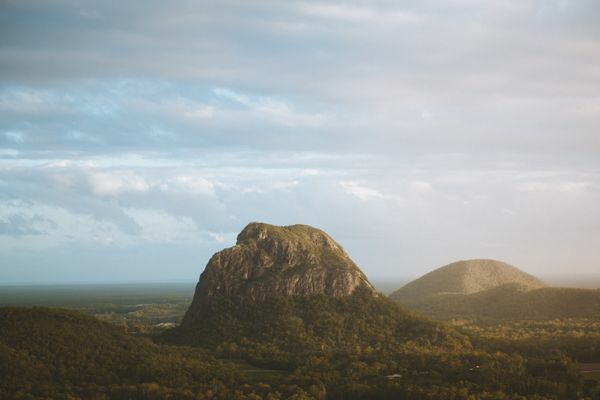 The magnificent rocky outcrops that make up the Glass House Mountains are actually remnants of volcanic activity that occurred about 25–27 million years ago. As the volcanic mountains cooled, stunning vertical columns emerged. Today, they have become iconic landmarks on the Sunshine Coast and a popular location for bushwalkers and hikers to explore. The most notables peaks are Mount Beerwah, Mount Tibgrogargan, Mount Coochin and Mount Coonowrin. Long before white settlement, the Glass House Mountains region was a special meeting place for Aboriginal people to gather for ceremonies and social activities. Events were planned for times of the year when local food sources were abundant, like the bunya nut festival. This allowed thousands of people to gather together without the risk of running out of food supplies. The Glass House Mountains remains a place of spiritual significance to local Aboriginal people – with several sites still considered sacred. The indigenous way of life changed during the 1860s when vast areas of timber were felled and burnt to make way for farmland. In 1890, a railway from Caboolture to Landsborough was constructed which resulted in more intensive settlement. Ex-servicemen and their families were encouraged to move to the region in the 1900s under the Beerburrum Soldier Settlement Scheme which provided them with land where they grew pineapples. However, many farms were unsuccessful which resulted in men turning to the timber industry to earn a living. A saw-milling town called Campbellville was established on the banks of Coochin Creek where timber was processed and floated downstream to Pumicestone Passage. Today the local industry still produces exotic pine and native hardwood timber from plantations in the region. The Glass House Mountains National Park was listed on the Queensland Heritage Register in 2007. The rock formations support diverse habitats including shrubland, montane heath, woodlands, open forest and small patches of rainforest patches on some peaks. The area is rich in endemic and threatened species including 26 plant species of conservation significance.Koalas, echidnas, grey kangaroos, goannas and a variety of other reptile species can be found in the Glass House Mountains. In terms of birdlife, the rocky outcrops are home to kookaburras, cockatoos, lorikeets, rosellas, peregrine falcons and the glossy black-cockatoo, which is considered vulnerable to extinction. The Glass House Mountains is a popular location for a range of outdoor activities including hiking, abseiling, rockclimbing, mountain biking and horse riding. Some of the walking tracks in this area are very steep and require a certain level of fitness and experience. There are also restrictions on roped sports on certain peaks. To capture the best photos of the Glass House Mountains, head up the Blackall Range to Mary Cairncross Scenic Reserve near the town of Maleny. The reserve offers panoramic views – as well as 55 hectares of subtropical rainforest full of diverse plant and animal life. The Wild Horse Mountain lookout is in Beerburrum State Forest, east of the Bruce Highway. Named after the brumbies that used to live there, the lookout provides views of the mountains as well as Pumicestone Passage. There's also the Glass House Mountains Lookout which offers spectacular photo opportunities of the volcanic peaks and across the ocean to Moreton Island. The Glass House Mountains can be found about an hour's drive from Brisbane. Follow the Bruce Highway north, take the Glass House Mountains tourist drive turn-off and follow the signs. There is the Glass House Mountains Visitor Information and Interpretive Centre at Settler's Rotary Park, Reed Street, Glass House Mountains where you can pick up maps and walking trail information.